Given its two thousand-year history, it would be surprising if London had no secrets. Obviously, I cannot tell you how many it has, or what they all are… But It is certainly one of those places where you often turn a corner and stumble across something unexpected and interesting – a building, a memorial, some kind of arcane ceremony – even a street name with a seemingly obscure, but fascinating, past. Those aren’t real secrets though, are they? They’re just curious things that most people are unaware of. A real secret is far more serious, the kind of thing that could get you killed. I’m talking, of course, about the clandestine world of espionage. James Bond. George Smiley. Harry Palmer. Spooks. Except that these are fictional and, with the possible exception of Smiley, removed from reality. The genuine article, it strikes me, has little glamour attached to it, any drama being played out covertly, avoiding unwelcome discovery, or publicity. Most of those involved can’t go home and discuss their day with the family, and can never admit to what they do, or have done. Occasionally, aspects of this sometimes seedy undercover world are revealed – as in the case of Sergei Skripal, a former Colonel in the GRU, Russian military intelligence, who, with his daughter, was poisoned in Salisbury with a Novichok nerve agent in March 2018. We must assume that such revelations are mostly accidental, though no one tried very hard to conceal the attempted murder of the Skripals. Britain, for all its well-mannered tradition of fair play, is reputed to have a fairly good track-record in spying and signals intelligence – notwithstanding a few high-profile embarrassments, the most notable probably being the so-called Cambridge Ring of traitors – Donald Maclean, Guy Burgess, Kim Philby, Anthony Blunt and John Cairncross. The history of espionage is as old as kings and, in England, at least, dates back beyond the networks established by William Cecil, Lord Burghley, Elizabeth I’s chief advisor, and the man that came to be known as her spymaster, Sir Francis Walsingham. Perfidious Albion and all that – a label I suspect many Britons disapprove of with a private smile. But, by all accounts, there was no official, government, intelligence service in the United Kingdom until as recently as 1909, when a Secret Service Bureau was established. This morphed into the organisations known today as MI5, the Secret Service, which deals with threats inside the United Kingdom and is responsible to the Home Office, and MI6, the Secret Intelligence Service, which deals with overseas threats and comes under the Foreign and Commonwealth Office. The UK’s signal intelligence section, GCHQ (Government Communications Headquarters), has its roots in the First World War. The ‘MI’ followed by a number apparently means, military intelligence, section 5, 6 – or whatever. Sections 1, 2, 3 and 4 have, so it is said, fallen by the wayside; but I like to imagine they are still engaged in work of such sensitivity that even Wikipedia doesn’t know about it. Understandably, military intelligence has a long history, though the army’s Intelligence Corps, not formally constituted until 1914, was disbanded after the First World War before being re-formed in 1940. 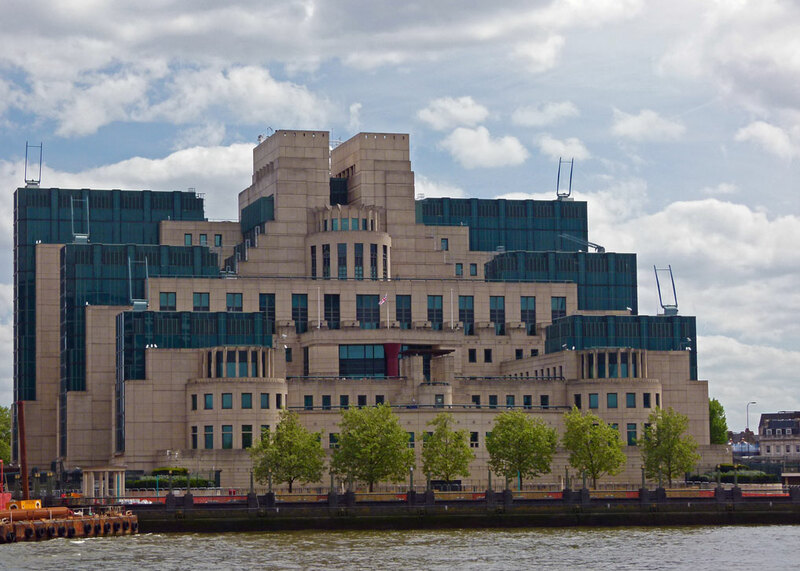 There have been – maybe still are – a raft of other secret intelligence agencies in the UK, from Naval Intelligence (where Ian Fleming spent his World War Two years), to today’s National Crime Agency. It was stories of cloak-and-dagger from the Second World War that initially drew me, one 21st century blustery spring day, to drop by a little of secret London. A Bit About Britain receives a degree of interest in an article Tracking down Britain’s secret SOE. The Special Operations Executive was an official, top-secret, organisation established on Churchill’s orders in 1940 for the purposes of subversion and sabotage. 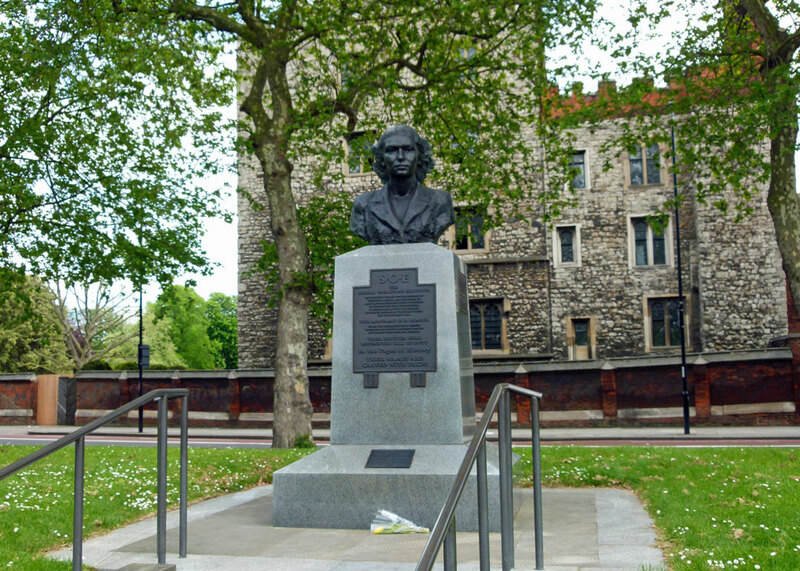 And I wanted to see a memorial to it, in Lambeth, just outside the Archbishop’s Palace. 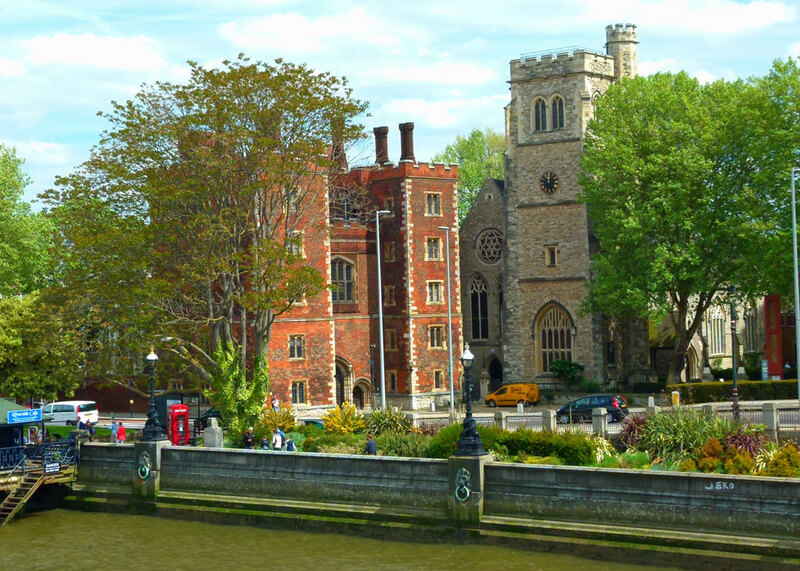 So I took the tube to Westminster and walked, past the heaving – and at that time partially scaffold-clad – exterior of the Houses of Parliament, past the cute Jewel Tower – a reminder of the old medieval Palace of Westminster – and through Victoria Tower Gardens to Lambeth Bridge. Across the bridge is the historic Palace of Lambeth, for eight centuries or so the London residence of the Archbishops of Canterbury. A small, well-tended, garden runs along the river side of Lambeth Palace Road, and there, close to an ice-cream kiosk, I found what I was looking for. NOT SURVIVE THEIR PERILOUS MISSIONS. IN THE TELEMARK REGION OF NORWAY. THE ATOMIC BOMB WAS THWARTED. THE LIBERATION OF FRANCE IN 1944. DID NOT SURVIVE THEIR MISSIONS TO FRANCE. It is curious that the memorial only specifically mentions operations in France and Norway. SOE operated throughout occupied Europe and the Middle East, as well as in Japanese-occupied Asia – where its job was, arguably, even harder than when pitched against the evils of Hitler’s Nazis, not least due to depressing rivalry between the British and Americans who were, with good reason, suspicious of each other’s objectives. 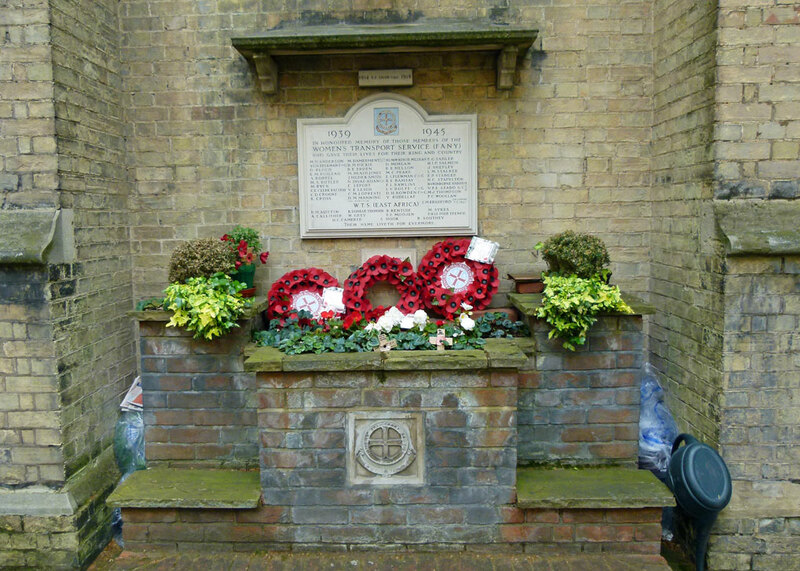 In any event, the memorial in Lambeth is a modest ‘thank you’ to the thousands of men and women, most of whom, sadly, we will never hear about, who volunteered for such dangerous, anonymous, work. Knowing I could never do it, and grateful that I have never been asked, it was humbling to commemorate them in a small way. Nor was I the only one to remember; someone had left a forlorn, cellophane-wrapped, bunch of yellow tulips at the base of the plinth. However, nobody walking along a moderately busy Albert Embankment that day stopped to even read the inscriptions while I was there; this part of secret London remained secret for them. 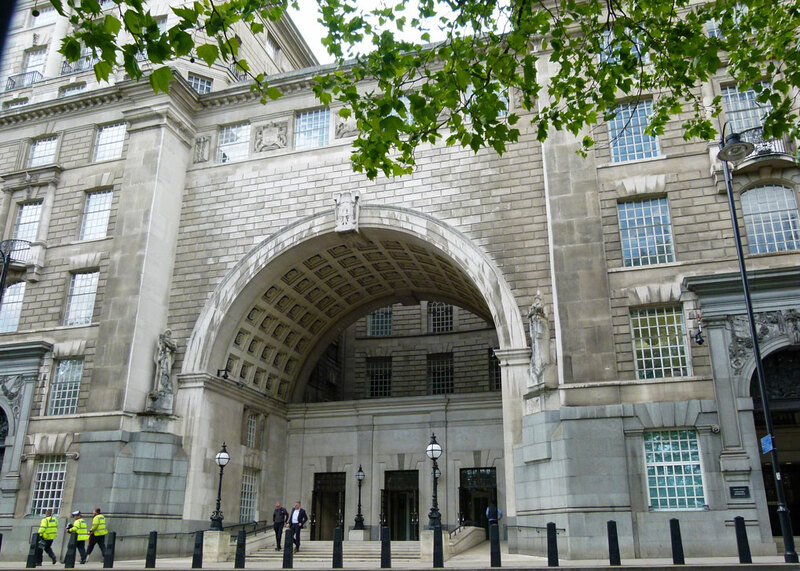 Crossing back over Lambeth Bridge, a left turn along Millbank took in exterior views of the headquarters of both MI5 and MI6, buildings which, until relatively recently, did not officially exist. Not only secret London past then, but secret London present too. After taking a few shots (photographs, to be clear) of the SIS building from a safe distance, I set off for our next piece of secret London. Unfortunately, I had left both cars – the silver Aston Martin DB5, as well as the grey 1933 4.5 litre Bentley convertible fitted with an Amherst Villiers supercharger – at home and instead of strolling a short distance to Pimlico underground station, or hailing a cab, stupidly decided to strike off on foot across London. No doubt this tactic convinced the dodgy-looking blokes following me that I was a harmless idiot; I’m confident I’d shaken them off by the time I staggered, exhausted and foot-sore, into the exclusive, too-perfect, area of Belgravia. My port of call here was a church, St Paul’s in Knightsbridge, built in 1843. Outside, frankly, it is a little lumpen, its churchyard now seemingly rented to wealthy residents and diplomats as a car park. 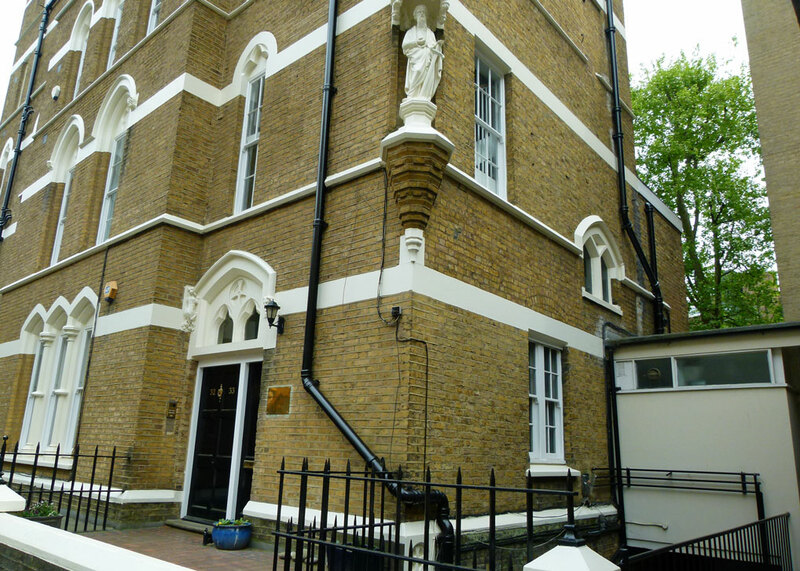 Inside, it is elaborate Victorian, the first church in London to champion the ideals of the ‘Oxford Movement’ – the so-called ‘Tractarians’ who sought to restore a sense of Catholicism to the established Church of England. But I hadn’t come to see the church and, anyway, it was a little too obvious for my liking – rather like a woman with too much make-up and not enough skirt. No, the significance of St Paul’s Knightsbridge to secret London is that, during WW2, the church was frequented by members of the First Aid Nursing Yeomanry (FANY), which was given the vicarage next-door to use, rent-free, as its headquarters. The First Aid Nursing Yeomanry had been founded in 1907 as a private, all-women, para-military organisation to provide – of course and as its name suggests – first aid on the battlefield via horseback. During the Second World War, FANYs served in a huge number of theatres (including a contingent in Finland), as drivers, nurses, clerks, wireless operators, radar operators, PAs, encryption specialists – and as agents in the SOE. A memorial on the outside of the north wall of St Paul’s church commemorates 52 FANYs who died on active service in World War II, carrying out secret intelligence work for the Special Operations Executive in occupied countries, as well as providing transport drivers for the Auxiliary Territorial Service (ATS). Three were holders of the George Cross, the UK’s second-highest award for courage in circumstances of extreme danger. Underneath the main tablet, obscured by a poppy wreath, I found a small plaque commemorating one of SOE’s best-known agents, Odette, who was captured by the Germans, cruelly tortured and eventually shipped to Ravensbrück where, unlike Violette Szabo and others, she somehow managed to survive the war. A film was also made of Odette’s experiences. It was a shame that the sides of the memorial appeared to be repositories for rubbish. The First Aid Nursing Yeomanry remains a vibrant organisation to this day, its website describing its purpose as “to provide assistance to civil and military authorities in times of emergency.” Its Commandant in Chief is Anne, Princess Royal, who gave permission for her title to be used, so the corps now has the snappy moniker of FANY (Princess Royal’s Volunteer Corps), or FANY (PRVC). There is a touching photo of Odette, under her previous married name of Sansom, with Violette Szabo’s daughter, Tanya, in the history section of FANY’s website. A final, vaguely interesting, fact about St Paul’s, Knightsbridge: Winston Churchill’s mother, Jennie Jerome, married her second husband, George Cornwallis-West there in 1900. One of the witnesses was Winston himself, who of course later sponsored the formation of SOE. My final visit to secret London that day took me across Hyde Park to Oxford Street and the southern end of Baker Street. 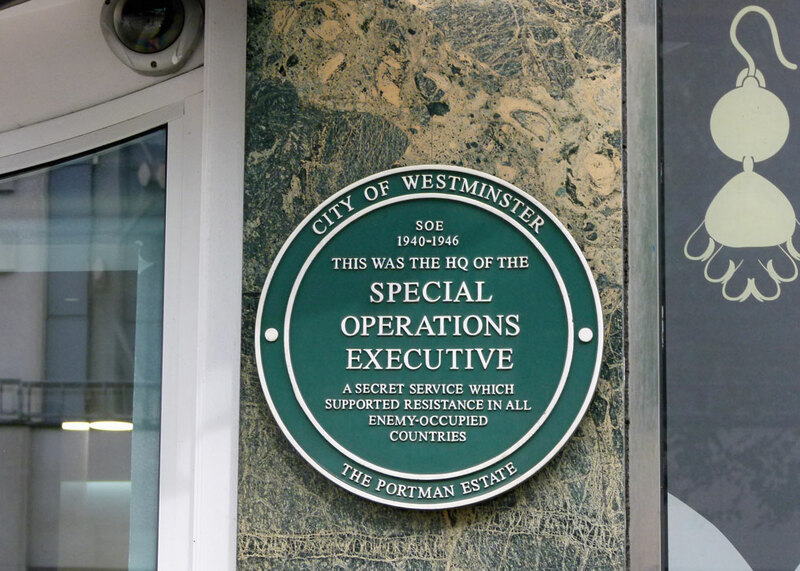 The Special Operations Executive had its headquarters at number 64 Baker Street, a detail noted by a plaque on the wall. In fact, SOE took over so many buildings in the area that the organisation was often referred to as ‘Baker Street’. The locations included Bickenhall Mansions, Montagu Mansions, 1 Dorset Square (noted by another plaque) and Norgeby House, 83 Baker Street, where F section, headed by Maurice Buckmaster (1902-1992), dealing with operations in France, had offices. For security reasons, agents were not allowed into headquarters, so F section used to meet its agents at 68 Orchard Court in Portman Square. It is curious to think of all that furtive activity going on, right under everyone’s noses. One agent, John Goldsmith, wrote that, despite the measures taken to avoid agents meeting up, many used to congregate in the Gay Nineties bar in Berkeley Street (or possibly Bruton Street). 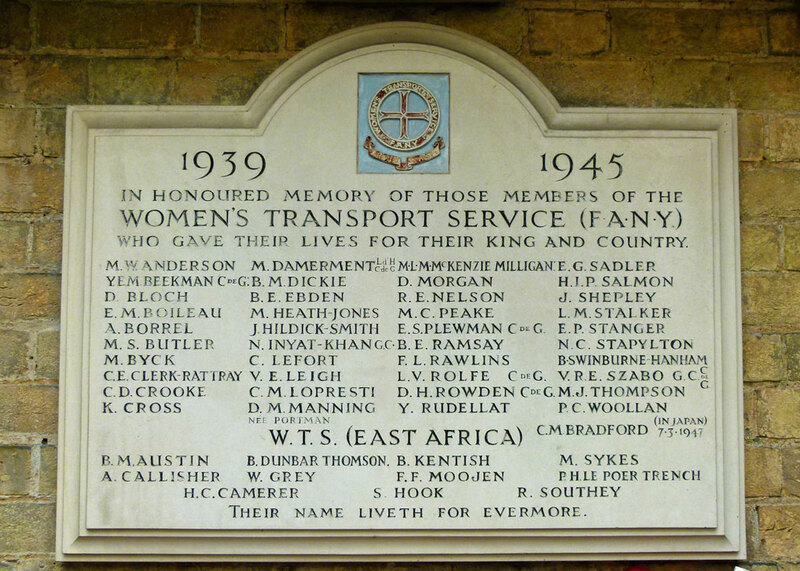 The plaque at 64 Baker Street – now a fairly tatty building – was unveiled in May 2010 by Margaret Jackson MBE, who was PA to Brigadier, later Major-General, Colin Gubbins (1896-1976), head of SOE from 1943 and known by the initial ‘M’. Margaret Jackson, who was just 23 in 1940, died in Croydon on 2 June 2013. If you’d like to know a little bit more about SOE, I can’t recommend the previously mentioned article, Tracking down Britain’s secret SOE, highly enough. Meanwhile, please eat this brief account of aspects of secret London after you have read it. This is another I was saving till I had the time for a good long read! It was worth every minute — just fascinating. I’m familiar with some of this — VIolette and Odette, Baker Street — but not with this detail. I think I need to hunt down that article! You have uncovered some things that I need to investigate next time I am in London. There’s enough intrigue in this post to supply hundreds of authors with material for an untold number of spy stories! I was touched by the bust and the story about Violette Szabo. So many heroes came from those dark days. Did you ever read about the Italian bicyclist who smuggled secrets in his tires right under the Gestapos’ noses? I’ve wanted to find more about him. Thank you for the post, Mike. Excellent as usual. I’ve missed reading them. No, I hadn’t heard that story. Hope all is as well as can be. Hugely impressive research and delivery, as always. I was shocked to see all that rubbish stuffed behind the memorial. I hope it had been put there temporarily! Excellent post, as ever, Mike. Another incredibly fascinating post, Mike. Thank you. I had not realised that Norsk Hydro, under Nazi occupation, were involved in atomic research although I probably ought to have done. On my mantelpiece is a piece of glass sculpture presented to me when I visited, with a group of local councillors, the Norsk Hydro fertiliser plant (formerly Fisons) on the South bank of the Humber in the 1980s. Thanks, Frank. There was a suitably gung-ho film, the Heroes of Telemark, starring Kirk Douglas and Richard Harris. I’ve put a link to Norsk-Hydro’s website, which summarises the real story, in the text of the article in case you’re interested. Wouldn’t you just love to read some of those secret files from history? I’m learning more since starting this little project..! Wonderful post. I just read a historical fiction work about Telemark. Thanks, Denise. Interesting – I’ve put a link to Norsk-Hydro’s website, which summarises the real story, in the text of the article. Ok, will take a look at it! Thanks, Derrick. 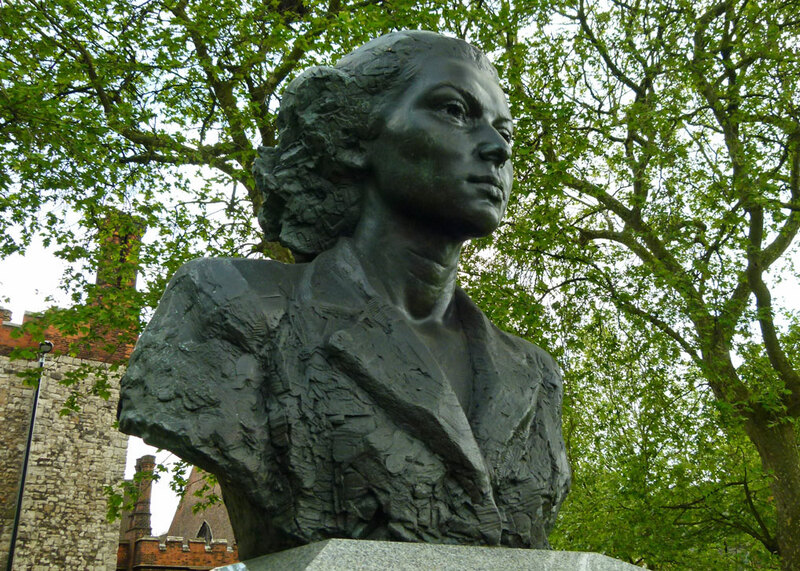 There is actually a Violette Szabo museum – details in the directory. Thank you Mike, what a great post. The Cambridge Spy Ring still fascinates today. I imagine many of their secrets died with them. Yes, I think that’s inevitable. Having seen several of the buildings you describe (including those housing MI5 and MI6) during my last visit to London, your post had me mentally strolling those streets again! *Cough* I should’ve had a glass of water to wash it down! Thank you for another fascinating article, and also a wonderful tribute to the people who sacrificed without recognition. Excellent post Mike, and cool photo’s. I’ve read a lot about the S.O.E and it was quite horrific. I was amazed to discover how uncoordinated some of the clandestine operations in WW2 were – lots of inter-departmental rivalry. Very detailed, Mike! Intelligence operations fascinate me from the scholar’s point of view, past and present. The SOE certainly operated throughout occupied Europe. My parents knew a man who only late in life admitted to what he’d been doing during the War. He was a Dutch Resistance member, and some of that included coordinating with SOE on the ground. Fascinating! Holland had it very tough. What a super post, and so well illustrated. My mother’s mother was a member of the FANY – which is how she met her husband during the Great War. My mother – wartime ATS – was part of an inter services section making radios for the French and Dutch resistance movements, based at Park Royal in London. All very hush hush and all that which didn’t prevent the staff in the British Restaurant down the road from knowing all about it. Mother said hat she and her colleagues always wondered about the people operating and depending on those radios and when we moved to France she had the chance to meet some of them…horrifying stories of betrayal, torture, imprisonment and death. Your post brings it all back to me. I bet that was fascinating – but harrowing. Always amazes me, what people did. Very informative and well-written post, Mike. Thank you for posting. All the Best, Rick.